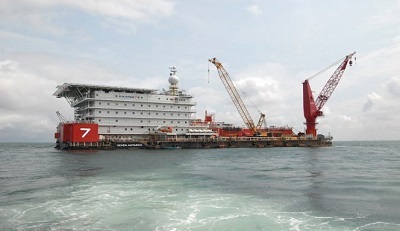 Subsea 7’s Nigerian affiliate NigerStar 7 has acquired the pipelay vessel Seven Antares. This is according to a news report by Offshore Energy Today. “The vessel will provide both NigerStar 7 and Nigeria a fully owned versatile pipelay vessel ideal for conventional, heavy-lifting and hook-up project,” NigerStar 7 said in a statement earlier this week. Built in 2009, Seven Antares has a 300t main crane capacity and is a 120t S-lay vessel with the capacity to lay pipe of up to 60-inch diameter. The vessel has an accommodation area in excess of 330 berths and a deck area of over 1300m². NigerStar 7 said the Seven Antares acquisition added up to other recent investments made by the company to strengthen its local fleet and its commitment to the development of Nigerian offshore oil and gas industry. The EPCI firm said the move reinforced its role in the ownership of Nigerian flagged vessels and reflects its strategy of domiciling its fleet with the objective of meeting clients’ needs and the requirements of the Nigerian Local Content Act. Almost exactly a year ago, NigerStar 7 was awarded a large deal by a subsidiary of ExxonMobil, for the production uplift pipeline projects (PUPP) in shallow water, offshore Nigeria. Subsea 7 at the time said the value of the contract was estimated to be between $150 million and $300 million and that the Seven Antares would be used for the project between Q3 2018 and Q1 2019. The contract scope includes engineering, construction, transportation, installation and pre-commissioning of 20 kilometers of 24″ corrosion resistant alloy (CRA) pipeline between the Idoho platform and the terminal onshore and of two kilometers of 24″ CRA pipeline between the Edop and Idoho platforms, as well as associated topside modifications and tie-ins at both ends.